Only 7 per cent of 12 to 14-year-olds' lesson time in England's schools is allocated to languages - half the amount of time devoted to sciences - the Organisation for Economic Co-operation and Development (OECD) study shows. Dr Lid King, the Government's national director for languages, warned that in some schools the figure could be even lower as new curriculum flexibilities were being used to pull even further back from language teaching. Recently, Education Secretary Michael Gove said: "I am deeply concerned that fewer and fewer students are studying languages, it not only breeds insularity, it means an integral part of the brain's learning capacity rusts unused." Heads' leaders warned that the damage could be irreparable, as French fell out the top ten most popular GCSEs for the "first time in living memory" and the figures showed that numbers studying French and German had both halved in a decade. John Bangs, a visiting professor at London University's Institute of Education, said: "This is part of the running disaster of modern foreign languages in this country." First of all, though you recently registered on the forum, I did it still later than you and let me tell you I'm very happy to meet you on the forum. Your words are very interesting and I have plenty of comments and lots of questions to know more about the study or about your feeling. 7% in England... Are English language classes included in the figure or is it foreign languages only? Would you know what the rates are in France and in other European countries? Reading the text, I assume it's the figure for foreign languages and think it might not be better in France. We say in France that we are not good at foreign languages (I personally listed oodles of reasons that explain our poor environment in the matter). I was surprised to read in a book written by Alex Taylor, that the British situation was not better! Given the larger range of sounds heard by a British ear, I though the English could understand better and be more talented than the French regarding foreign languages. > it means an integral part of the brain's learning capacity rusts unused. -3- non scientific matters should have more importance as they are necessary to be able to think properly and manage our lives correctly and finally be happier. -4- languages (foreign cultures) are very important to build a better world. > numbers studying French and German had both halved in a decade. When did learning French stop to be mandatory in England? In the sixties, the seventies? Hello everybody ! I'm coming back after 6 weeks being busy on family matters. I must now catch up with all the reading of your most interesting articles. Pleased to meet you Gerard : I will answer to you first about the non-interest of the British for the study of French and German. This is most amazing, when one realizes how many British citizens buy houses in France ; are they wealthy seniors who can manage with an only-English speaking surrounding ? Moreover, would that mean they rather choose Spanish, for sure there still is an option for languages in the GCSE ?? I have been fighting all my life with BAC "C" versus BAC "A" or "L"... Which one is more important ? I would say it depends on how you are gifted, that's all. But both are equally important, aren't they ? Very pleased to meet you on the forum Ghislaine! I have to go out to organize next weekend: order a big cake and other stuffs to celebrate my son's birthday and the meeting of the whole family. I post again when I'm back. I took scientific classes and schools. My words might be a bit ambiguous. I didn't mean non-scientific matters deserved more importance than scientific ones but just more importance than they have nowadays. which is not the case in Britain according to British education responsibles. which show some general, but a slow improvement. It is true that Initial potential of learning other languages is related to the sounds set of the native language. But the motivation to learn remains a factor of important weighting. Derek Amato is truly one in a billion. He is possibly the only person in the world to have acquired musical ability after a traumatic brain injury. A severe concussion left him with the ability to play piano, an instrument he had never played before. He now plays professionally and earns his living as a musician. Now, the music never stops. He sees it constantly streaming in front of his eyes in the form of black and white squares that compel him to play. Derek journeys to the Mayo Clinic to meet with one of the world's top neurologists to try and find a way to control the incessant stream of music: an incredible gift that is also his curse. I do advise you to watch this video which shows how astonishing the possibilities of human brain are. I have read this article in "courrier international" and i have found that amazing. Darold Treffert a famous scientist studied this savant syndrom in disabled people and people with a sudden central nervous system injury. What I find interesting is its implication for education and future research. Savant syndrome is a rare, but extraordinary, condition in which persons with serious mental disabilities, including autistic disorder, have some ‘island of genius’ which stands in marked, incongruous contrast to overall handicap. As many as one in 10 persons with autistic disorder have such remarkable abilities in varying degrees, although savant syndrome occurs in other developmental disabilities or in other types of central nervous system injury or disease as well. The act of walking may not seem like a feat of agility, balance, strength and brainpower. But lose a leg, as Zac Vawter did after a motorcycle accident in 2009, and you will appreciate the myriad calculations that go into putting one foot in front of the other. Taking on the challenge, a team of software and biomedical engineers, neuroscientists, surgeons and prosthetists has designed a prosthetic limb that can reproduce a full repertoire of ambulatory tricks by communicating seamlessly with Vawter's brain. While knowledge of a protective effect of bilingualism isn't entirely new, the present study significantly advances scientists' knowledge. Media reports emphasize the size of its cohort: 648 patients from a university hospital's memory clinic, including 391 who were bilingual. It's also touted as the first study to reveal that bilingual people who are illiterate derive the same benefit from speaking two languages as do people who read and write. It also claims to show that the benefit applies not only to Alzheimer's sufferers but also people with frontotemporal and vascular dementia. yes but it was in French. Let's read it all over again and enjoy the good news. learning languages is a good way to keep the brain in shape,"
Thanks Gérard, I will remember. What about you dear café polyglotte sur le net dear members ? Neuroscientists have known for more than a century that one small part of the brain—called Wernicke's area, located in a region called the superior temporal gyrus—plays a critical role in how humans process language. But it's been difficult to develop a deeper, more detailed understanding of that process, partly because scientists lacked the tools to study in real time how the brain responds to split-second sounds. By placing dogs in an MRI scanner, researchers from Hungary found that the canine brain reacts to voices in the same way that the human brain does. However, that's what rresearchers think. Scientists have discovered that a gene-regulating protein that guards the developing brain of a fetus reboots in old age and may protect against dementia, a finding that could open a new path in Alzheimer's research. The research by Harvard University scientists published Wednesday in the journal Nature, showed the protein, dubbed REST, is depleted in brains of people with Alzheimer's. It was found at a level three times higher in those who didn't become demented even when they had brain markings of the disease. 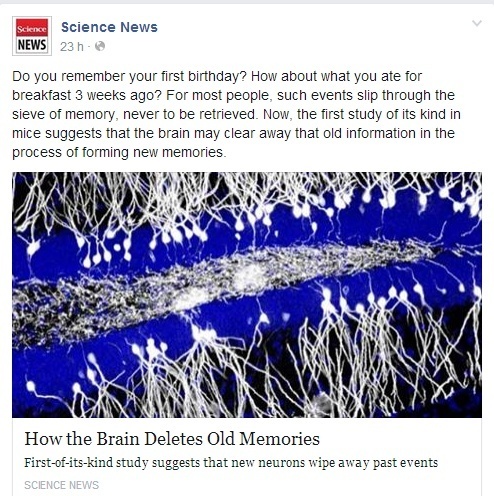 Until now, REST wasn't known to play a role in the adult brain. Simulating the human brain is one of the holy grails of computing — but it's extraordinarily difficult to do. Just last year, the longest simulation of brain activity to date was achieved. It used the fourth-most powerful computer in the world, Japan's K Computer, 705,024 processor cores, and running at speeds of over 10 petaflops. 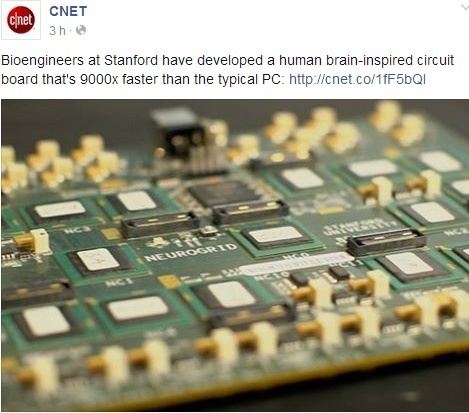 The simulation, using 92,944 processors, took 40 minutes to simulate one second of brain activity over the equivalent of one per cent of the brain, around 10.4 trillion synapses. yes it is all the more difficult that every brain is wired differently. We wrongly assume every brain is the same. Thanks for your additional words. Scientists have observed that reading ability scales with socioeconomic status. 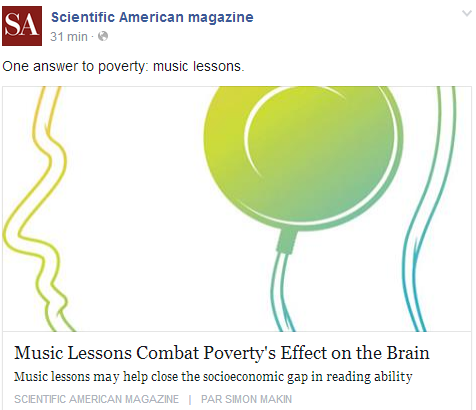 Yet music might help close the gap, according to Nina Kraus and her colleagues at Northwestern University.